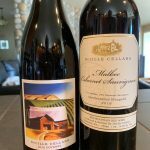 DeLille Cellars Delicious New Winter Releases - Write for Wine: It's Wine O'Clock Somewhere!Write for Wine: It's Wine O'Clock Somewhere! This is a seriously delicious, luxurious, rich Bordeaux-style blend. Malbec dominates this gorgeous wine (71%), complemented by 29% Cabernet Sauvignon; 100% of the fruit was grown in a single block at Quintessence Vineyard in Red Mountain. With a deep inky color, Quintessence opens up with aromas of dark fruit, leading into flavors of more black and blue fruit, with hints of licorice, earth and minerality. Certainly, this wine has structure, balance and character. Pair it with flank or sirloin steak, chicken, lamb or pork. Or for a touch of decadence, enjoy Quintessence with a juicy burger topped with blue cheese. But remember, this wine is still young, so cellar it, if you have patience. Doyenne means “wise” or “expert” in French, and this stellar wine pays tribute to the historic Rhône wine region in southern France, and to the city of Aix-en-Provence. This is a blend of Syrah (60%) and Cabernet Sauvignon (40%), which means the well-integrated flavors of Syrah are combined with the structure of Cab Sauv. The result is simply delicious. Specifically, flavors of red and black fruit merge with meaty, savory and spicy notes. And the result is a layered, complex and rich wine, which is approachable now or is drinkable for the next ten years. Pair it with barbecued ribs, grilled meats, Italian dishes or beef stew. Thanks to DeLille Cellars for these samples. Another chapter in DeLille’s story begins this fall, when the winery, tasting room, and offices move to the iconic Redhook brewery building in Woodinville. 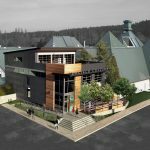 The new location, showed in DeLille’s rendering, will feature a three-level tasting room, event space, outdoor patio and rooftop deck with views of the Sammamish Valley and Mt. Rainier. Not surprisingly, we are really looking forward to the grand opening! Of note, all current operations will remain open until the new space is ready. This entry was posted in Bordeaux Blend, Cabernet Sauvignon, Malbec, Red Mountain, Syrah, Washington, Wine, Woodinville and tagged Bordeaux blend, Cabernet Sauvignon, DeLille Cellars, Doyenne, Malbec, Quintessence, Red Mountain, Rhone blend, Syrah, Washington wine, Washington wineries, wine, wineries, Woodinville by Margot. Bookmark the permalink.